Indonesian President Joko Widodo, left, and his contender Prabowo Subianto, shake hands after a televised debate in Jakarta, Indonesia, Thursday, Jan. 17, 2019. In less than a month, Indonesian voters will head to the polls. 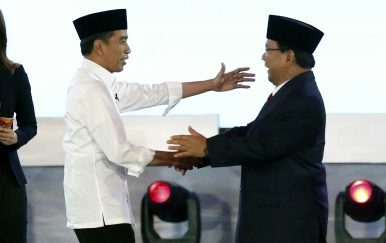 The fourth pre-election presidential debate between incumbent President Joko “Jokowi” Widodo and challenger Prabowo Subianto took place on Saturday, March 30. The fourth round of the debate focused on defense and foreign policy. Throughout the campaign period, observers and myriad news articles have predicted that foreign policy issues would be prominent during the campaign and presidential debates. Following the fourth presidential debate on defense and foreign policy, we now have a better understanding about issues that are, and are not, salient. While understanding the presidential candidates’ foreign policy stance helps Indonesian voters and other countries gauge Indonesia’s future trajectory in the international arena, another equally important and broader question here is this: To what extent does foreign policy matter to voters in the 2019 Indonesia election? For foreign policy to influence the election, some political scientists such as John Aldrich and others have suggested that there are three conditions that need to be present. First, voters must have stable, coherent attitudes about foreign policy. Second, the public must be able to access these attitudes when they vote. Third, the candidates must uphold distinct or contrasting foreign policy platforms so voters can use their established attitudes to distinguish between candidates. Years of research on foreign policy and public opinion in Western democratic countries such as the United State show that public does tend to have stable, coherent attitudes about foreign policy. The stability of public opinion is examined by employing repeated questions by multiple pooling organizations. Even though public opinion changes, such change is precipitated by changes in the international environment. Do we observe the same trend in Indonesia? Given the lack of time series survey research about Indonesian public opinion on major foreign policy issues, it is hard to argue conclusively whether Indonesian voters have stable or coherent attitudes on foreign policy. However, there are public opinion surveys available that provide us a snapshot or baseline of Indonesian views. Based on public opinion surveys from major news outlets and polling organizations, there is reason to doubt the salience of such indicators when it comes to answering such questions in Indonesia. For example, on the issue of the influx of foreign workers, surveys by the Center for Strategic and International Studies in Indonesia in 2017 showed that around 70 percent of the respondents reacted negatively toward the presence of foreign workers. However, another survey showed that only 27.8 percent of Indonesian are concerned with the influx of foreign workers and think that they endanger the sovereignty of the country. What about national security issues? One major foreign policy issue confronting Southeast Asian countries, including Indonesia, is the rise of China and the status of the U.S. presence in the region. Based on the Global Attitude Survey, more than half of Indonesian respondents viewed U.S. power and influence as a threat. The third wave of the Asia Barometer Survey conducted from 2010-2012, suggested that there is a more positive view of China. Furthermore, from 2002-2005, Indonesia was among several countries that had the least favorable view of foreign policy. With regard to China, a survey by Pew showed that feelings toward China have been consistently favorable in Indonesia between 2002-2007. Based on this brief examination of these two major foreign policy issues, it seems that evidence on whether the public has consistent views is mixed. If the opinions of Indonesian voters on foreign policy are not coherent, then it is harder for both candidates to persuade voters to come to their side. As far as the second requirement is concerned, if the Indonesian public does have attitudes about foreign policy, they must be able to access those attitudes to express them in an election. In other words, they must be aware of their own perspectives on international issues. Since voters are busy people and tend to focus on issues closer to home, they tend to leave foreign policy to key foreign policymakers and rely on their cues to understand international issues. Some scholars of public opinion point out that media and key foreign policymakers help voters to access their views toward various international issues. News media and elite discourse lead people to pay attention to certain issues (priming) and force the public to think of those foreign policy issues in certain ways (framing). News outlets and pundits point out that President Jokowi and his challenger, Prabowo Subianto, have made reference to foreign policy throughout the campaign period. Among the issues that have been raised by the two candidates are China-Indonesia relations, the presence of foreign companies such as Freeport, the involvement of foreign consultants in the campaign, Indonesia’s role in the United Nations Security Council, Natuna Island, Palestinian statehood, and the role of hard military power in the maritime space. The fourth presidential debate, furthermore, helped bring the voters into more contact with foreign policy issues ranging from Indonesia’s national interests (territorial integrity and sovereignty, welfare and protection of Indonesian workers overseas, economic prosperity), threats to national interests (foreign invasion, foreign ownership of strategic assets), various means to achieve those goals (political and economic diplomacy, military power) that they would perhaps otherwise be unaware of. Thus, the public seems to be presented with ample opportunities to access their attitudes regarding foreign policy. The last criteria necessary for public opinion about foreign policy to be able to influence election concerns is the foreign policy platforms of the candidates. Do Jokowi and Prabowo present voters with contrasting foreign policy choices? So far, not really. As the fourth debate demonstrated, both candidates seemed to agree on main national interests: territorial integrity, sovereignty, and economic prosperity. However, it is important to note that each chose to give more weight to certain issues. On the topic of international relations in the fourth debate, Jokowi, for example, chose to highlight economic prosperity and discuss trade diplomacy as one of the means to achieve prosperity in his opening statement, and he chose to take the security of the nation from external military invasion as a given. As the exchange between two candidates on international relations continued, Jokowi reminded voters that he is equally committed to national sovereignty and territorial integrity as Prabowo, albeit conveyed in a more soft-spoken manner. Prabowo, however, preferred to focus on the issue of defense and the importance of boosting defense spending to defend the nation against external military threats in his opening statement. As a former military man, Prabowo believes that military power can be a key to the success of negotiations, even in multilateral settings. In his subsequent statements regarding international relations, Prabowo did not contest or offer contrasting views to Jokowi’s argument about the need of international trade or foreign investment. Nor did he disagree with Jokowi’s opening statement about Indonesia’s role as the biggest Muslim country and one that is set to play a mediating role in conflict areas worldwide. This might have left the audience who watched the debate wondering if Prabowo opposed or supported Jokowi’s views on these specific issues. The agreement on core national interest notwithstanding, the different emphasis each candidate put on the three core national interests areas and the means to achieve them might lead some voters to cast ballots based on foreign policy or at least build broad support among certain voting segments. For those who value an aggressive or tough stance on defense, political, or economic issues might value Prabowo’s oratorical style and his military-first approach. Meanwhile, for voters who value international trade while also respecting national integrity and sovereignty along with a soft-spoken public speaker, they might side with the incumbent. However, public sentiment may not be as coherent as the limited evidence above suggests. The foreign policy debate could be considered by voters as lacking contrasting foreign policy platforms and be too filled with vague public statements. Perhaps voters will base their vote on non-foreign policy issues instead. The ability of voters to access their attitudes will not be relevant under this condition if other issues dominate their considerations. Angguntari C. Sari is a Fulbright Scholar and Ph.D. student in the School of Global and Political Studies, Arizona State University.